If edgy is right with the owner? check out the following video and door cards (may have been changed back for sale?) This GT3 has the same dash pull battery cutoff also. edgy you are spot on: Vin WP0ZZZ99ZYS691028 sold privately in NSW Dec 2018. Hi Hugh, do you have code 722 = Internal production code (GT-car) on your build sheet? Autohaus have just listed a black 996 GT3 MK1 Clubsport for $129,990 (seems well priced or cheap if all checks out OK) https://www.carsales.com.au/cars/details/Porsche-911-2000/OAG-AD-17072815/?Cr=1 Noticed on the build spec it has the code 722 = Internal production code (GT-car),1st time I have seen this code. p.s. delivered to Brisbane 2 days after my car (18th Feb 2000) _ only visible mods RS steering wheel and side decal. To me they are only back to original RRP for a car with such a pedigree (1868 built, 308 being RHD, 90 del to Aus) still cheap compared to other collectible/desirable Porsche models. The Porsche 911 (996) GT3 was the spiritual successor to the original '73 Carrera RS and was designed to be light in weight and performance focussed with scant regard to luxury and comfort items that would add to the car's weight but detract from its performance. With the advent of the water-cooled 996, Porsche needed to find a way to continue the lineage of its motorsport-focused 964 and 993 RS models. The answer was the Mk1 GT3. Built by hand away from the main 996 production line, the GT3 enabled the homologation necessary for Porsche to provide cars for a wide range of GT racing series (including Le Mans) as well as a one-make Carrera Cup series. The significant difference between the mainstream 996 range and the GT3 was the dry-sumped Mezger engine, which used a completely different block from the rest of the range (being the same as that in the GT1). Thanks to its titanium and plasma-nitrided internals, it generated 100bhp per litre from its high-revving, high-compression, normally aspirated 3,600cc six-cylinder boxer engine. Performance was very impressive with 0-60 mph coming up in 4.8 seconds and a top speed of 186 mph. GT3 is a very special car and especially the first generation. It is the only GT3 built at Porsche development and research center in Weissach. It is the first and last GT3 with mechanical throttle and because of that you feel more part of the machine. 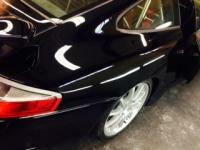 996 GT3 mk1 is simply the purest GT3 and gives the purest driving experience. Looks from a 2013 Sydney Morning Herald article stolen: Judge puts brakes on pursuit of lost Porsches By Steve Butcher 1 January 2013 — 3:00am A FORMER international racing driver's multimillion-dollar damages action - mostly to recover three classic Porsche cars - has failed, with a judge dismissing each of his claims. Retired Melbourne managing director James Rolfe alleged Investec Bank (Australia) was responsible for his seven shipping containers he said held the cars, valuable parts and personal items. James Rolfe: claims dismissed. Mr Rolfe, who had owned a Yarraville container business, claimed Investec took possession of the containers when it seized the land in 2003 to help recover an $11.8 million loan to his company. The County Court heard in 2012 Mr Rolfe had raced Porsches at international and Australian rallies. His transport logistics company, started in the early 1970s, allowed him to assemble a collection that included a 924 Carrera GTS, a 911 rally car - once just one in Australia of 50 worldwide - and a 924 GTR. But the assets of companies Mr Rolfe controlled were seized and sold, including two properties in Port Douglas, the Verandahs and the Boathouse. (A judge in 2007 awarded him $2.7 million damages against Investec for its sale method that undervalued the properties.) But not the three Porsches, or the thousands of ''very special'' nuts and bolts - many titanium - and hand-polished parts Mr Rolfe said he stored in the containers. He claimed Investec took possession of the containers when it seized the land and so had a responsibility to care for and protect them. Investec and co-defendants to the action, Gadens Lawyers and real estate agent Sutherland Farrelly, denied liability. In her recent decision, Judge Kathryn Kings said she accepted the evidence of a Gadens' solicitor that there was no conversation with Mr Rolfe or agreement that allowed him to store the containers on site. She said Mr Rolfe's evidence was ''confused, uncertain, inconsistent and unreliable''. Judge Kings found Investec did not know or consent to him storing the containers at the premises and dismissed his claims of negligence and misleading and deceptive conduct. Judge Kings accepted that Mr Rolfe owned containers and stored them at the premises and that the vehicles existed and were stored there ''at some point''. But he gave inconsistent evidence about ownership of the cars and parts and there was no written documentation to support his claim he had paid for them, she said. ''I am not satisfied that Mr Rolfe has discharged the onus to prove ownership of the vehicles,'' Judge Kings said. 996 Quality ❤️ In this month’s issue of Porsche Panorama, you can read about our 1,400-mile winter road trip in a 2002 Porsche 911 Turbo, which started in Easton, Pennsylvania, paused in Québec City, and ended in Ann Arbor, Michigan. While reporting on that story, Nathan Merz takes a moment in this video to give us his take on the all-wheel-drive 996 Turbo, a worthy companion, even in snowy weather.